Bishop Tawadros has been chosen as the new pope of Egypt’s Coptic Christians, becoming leader of the largest Christian minority in the Middle East. His name was selected from a glass bowl by a blindfolded boy at a ceremony in Cairo’s St Mark’s Cathedral. Three candidates had been shortlisted. 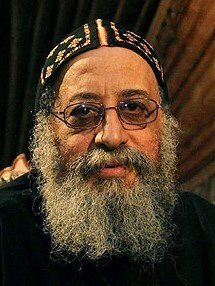 Bishop Tawadros, 60, succeeds Pope Shenouda III, who died in March aged 88. He succeeds as attacks on Copts are on the increase, and many say they fear the country’s new Islamist leaders. 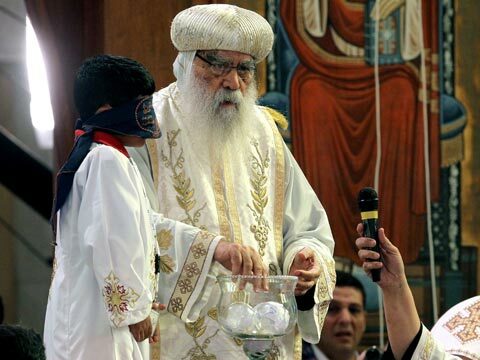 A blindfolded boy – one of 12 shortlisted children – then drew out the name of Bishop Tawadros, who until now was an aide to the acting leader, Bishop Pachomius. Bishop Pachomius then took the ballot from the boy’s hand and showed it to all those gathered in the cathedral. Strict measures were in place to make sure there was no foul play during the televised ceremony: the three pieces of paper with candidates’ names were all the same size and tied the same way. Copts say this process ensures the selection is in God’s hands. The new pope has studied in Britain, and has also run a medicine factory. He is a man of broad experience and with managerial skills and will need all those talents to lead the Copts as they face an uncertain future in a country now debating the role of Islam following last year’s revolution. No-one in Egypt expects the new pope to introduce radical changes to the deeply conservative church. He was a passionate advocate of unity among the Christian churches, and also clashed with then President Anwar Sadat, particularly over their conflicting views on the future of Egypt’s relationship with Israel. Coptic Christians have long complained of discrimination by the Egyptian state and the country’s Muslim majority.